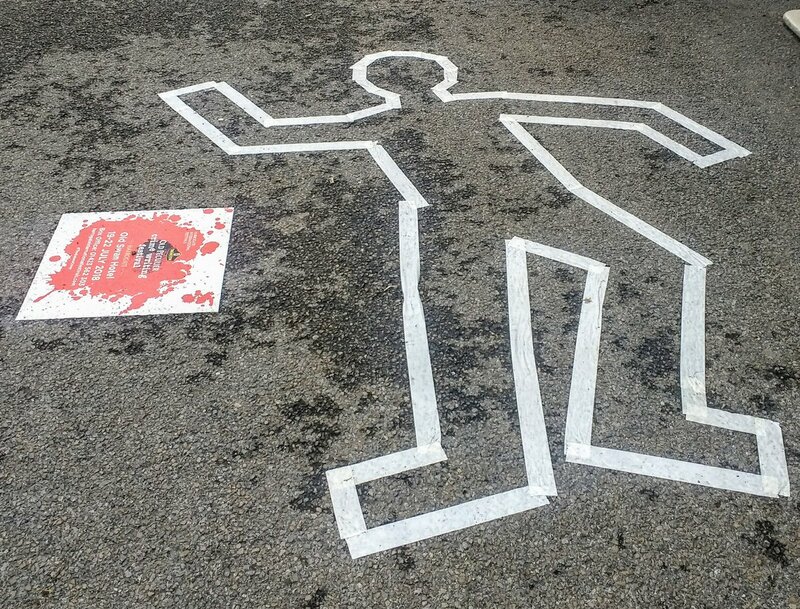 The Theakston Old Peculier Crime Writing Festival took place in Harrogate from 19-22 July 2018. Lynn Parkinson reports from North Yorkshire for the Literary Field Kaleidoscope. 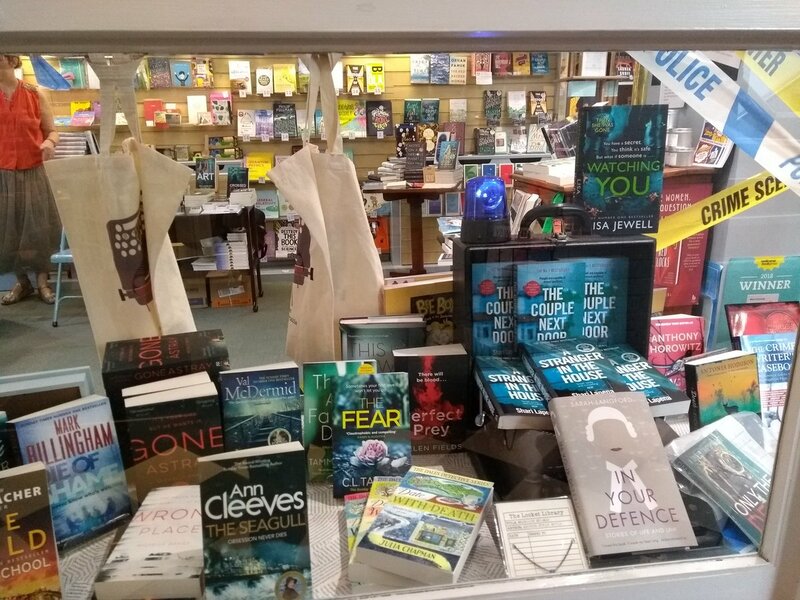 Harrogate is the home of crime writing in the UK! The Theakston Old Peculier Crime Writing Festival was initiated and realised by crime author Val McDermid, literary agent Jane Gregory, and the arts charity, Harrogate International Festivals. 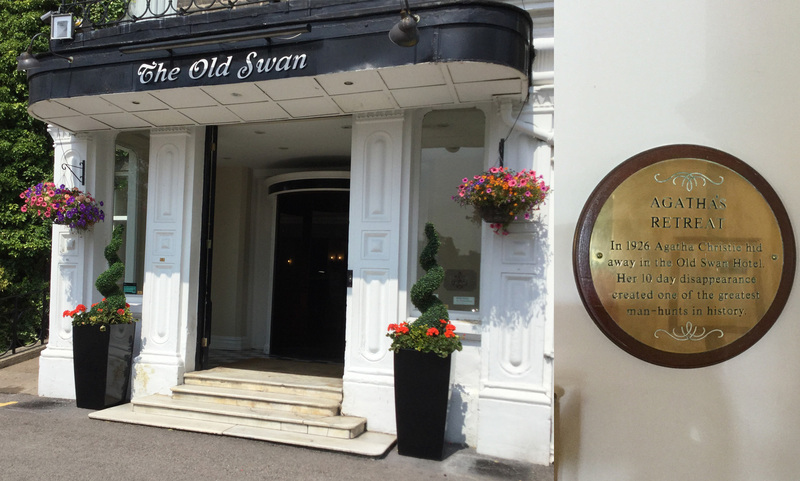 The first Harrogate Crime Writing Festival took place at the Crown Hotel in Harrogate in 2003, but the obvious popularity of the Harrogate Crime Writing Festival required a venue with more space. 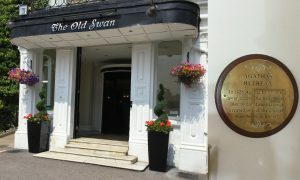 The obvious solution was to move a short distance, to the Old Swan Hotel in Harrogate. This was where Agatha Christie disappeared to when her marriage broke down. Since then, many famous crime writers from many countries have come to the Harrogate Crime Festival, and indeed delegates come from all over the world. Lee Child, the author of the Jack Reacher series, was the Chair of this year’s Festival programme. From the start, the event raced as fast as one of Jack Reacher’s novels – and the fans were as eager to find out more about the books and the authors, with presentation rooms full of avid fans. 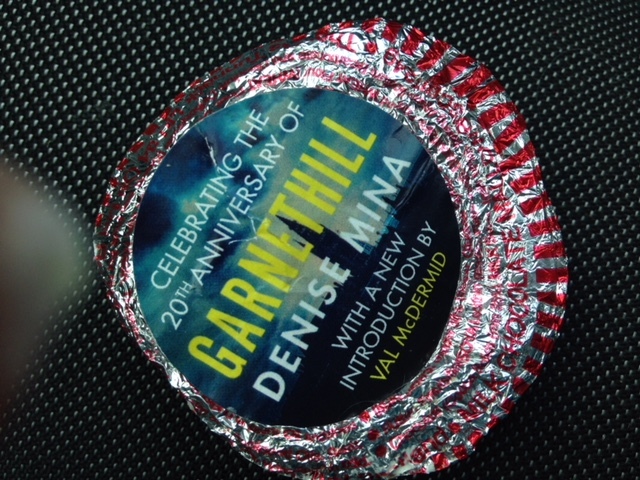 First on was “Dame” Denise Mina (that’s her twitter handle), whose publisher provided delegates with the Scottish “delicacy” of Tunnock’s Tea Cakes, with an amended wrapper to show her newest book title. Denise was interviewed by Stav Sherez (who won the Golden Dagger Award for the Best Book of the Festival). Denise shared some secrets of her writing, letting the enthralled audience into a “big” secret: writing is not as lonely as you think. 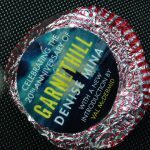 Denise said that on many days, there are 5 or 6 Glasgow writers all working in the Mitchell library in Glasgow. And she remarked: it is not all work! A former Harrogate Crime Festival Chair, Laura Wilson chaired an extremely lively panel, which included Gregg Hurwitz, who writes the Orphan X series (amongst his 19 books and various television series) and Rod Reynolds, one of Laura Wilson’s protégés on her crime writing course at City University. This was one of the liveliest panels! There appeared to be a greater variety of interview formats this year. Typically, the sessions are themed around the session title, and authors are interviewed individually or with several authors whose books have a common theme by a chair. A new approach was when Linwood Barclay and Laura Lippman, both from a news reporting background, discussed how they work and how it develops without any prompts. These authors were familiar to many of the audience, and their friendly co-interviewing approach felt as though we were eavesdropping on their conversation. But the festival also continued those formats that have proven very popular in the past: Val McDermid created the “New Blood” panel, a platform to encounter crime writers and their debut works. Clare Mackintosh (2015) and Abir Mukherjee (2016) were among the “New Blood authors in the past. This year, she chose the following four: The Ruin by Dervla McTiernan, The Chalk Man by CJ Tudor, The Seven Deaths of Evelyn Hardcastle by Stuart Turton and Dark Pines by Will Dean. A follow up to last year’s the “New Blood” session was the “What happened next?” session, chaired by Lee Child. Abir Mukherjee and his fellow panellists commented on how they were pressing forward with their writing careers – some clearly taking longer than others. One of the most commonly asked questions is “what is your writing routine?” The husband and wife writing couple, Nicci French (i.e. Nicci Gerrard and Sean French) had a session that focused on just this. They explained that they work in different locations at their home, and email drafts back and forward, with each editing each other’s work. There were some questions about how they felt about editing others’ work, but it was clear that this was a very effective writing team. Spoiler alert: the Nicci French duo reported that this is the last book with the Frieda Klein character. In this year’s line-up, many writers have legal backgrounds (e.g. John Grisham, a newcomer to the Harrogate Crime-Writing Festival) and US prosecutor Alafair Burke, while others have worked in intelligence, as risk or corporate investigators, or investigative journalists. Their research experience was essential to creating realism, even in fiction. Fiona Cummins, a former tabloid reporter commented about how hard it was to write “true life” crime, knowing about the associated sadness. Research is always critical to the credibility of a crime scene analysis. Dame Professor Sue Black and Val McDermid (who are apparently firm friends) went into the issues involved in analysing factual forensic investigations in fact and in fiction. They also reported how both Sue Black and Val McDermid benefit from blending forensic expertise and fiction. John Grisham was very much the southern man, a real gentleman, with strong values. He initially came across as somewhat reserved, but held the audience’s attention. The mutual respect for each other was evident. The evening bash with the Fun Loving Crime Writers band proved to be loud and fun! Mark Billingham, Christopher Brookmyre, Val McDermid, Stuart Neville, Luca Veste, and Doug Johnstone had people of all ages bopping and singing along to the band (link to the funlovincrimewriters website). The atmosphere was more subdued when Don Winslow was interviewed by NJ Cooper. NJ Cooper is, without doubt, one of the best interviewers. She is very attentive and insightful, and clearly prepares well in advance. Most delegates had not heard of Don Winslow, which might explain the attendance. But several authors commented on Don Winslow’s work and the festival organisers invited everyone to “be wowed by Winslow”. Despite my long term passion for crime fiction, I had never heard of Don Winslow. However, there was a growing buzz about his reflective and powerful books about the nature of the US society – and its problems. Apparently, each of Don Winslow’s books takes about 3 years of research and writing. His was not the best attended session, but his books sold out immediately and needed to be restocked. His concerned political and social commentary on various aspects of current US politics resonated with the audience on so many levels. The Scandi Noir sessions always attract UK readers, but there were striking differences between the panel writers. Icelander Yrsa Siggur and Norwegian Samuel Bjork sat alongside Anne Cleeves, whose books have been turned into popular British TV series. Yrsa commented on having a “double life” – she works as a project manager in the mornings, but then writes in the afternoon. Samuel Bjork dealt with the cold weather at home by going abroad to work! The final session was with Sophie Hannah, who has been writing psychological thrillers for many years, and who is now writing the “new” Agatha Christie novels. A Cambridge University Fellow, she is a bright, feisty, strong woman, and I suspect that Agatha Christie would be pleased to see her continue writing Agatha Christie books. The Theakston Old Peculier Crime Writing Festival is an adrenaline filled event, which appeals to young and old. Each year, you wonder how it can match a previous year’s Crime Festival. However, I was exhausted by the end of this Festival. The Harrogate festival team will be starting on the new programme, and I will buy my pass as soon as it is available. I recommend you attend if you are a crime fiction fan. Lynn Parkinson works with leading UK business schools, researching and teaching marketing topics.